If you enjoy cycling, there are several trails in Cornwall that are gentle enough for the whole family, but still offer plenty in the way of adventure. Nanny Pat’s been exploring the cycle routes around Bissoe with her family. Five year old grandson Wilf has just learned to ride a bike by himself, so he was also keen to take to the trail and show off his new skills. They did part of the Coast to Coast Trail, which runs from Devoran (near Bissoe) on the South coast to the Portreath on the North coast. This is Cornwall’s narrowest point – you can literally travel across Cornwall and back in less than a day. The full Coast to Coast Trail is 11 miles long, but you don’t have to do all of it – especially if you’re five and you’ve only just learned to ride a bike by yourself! The trail follows tramway and railway routes used to transport ore and supplies from the mines to the ports on the coasts. This also means it’s generally level, and mainly off road. As you cycle along the route, you’ll pass through the heart of Cornish tin mining country. There are old mine workings dotted across the landscape. There’s also plenty of opportunity for wildlife spotting. In early spring, when the gorse is at its best, it transforms the landscape with its vivid yellow flowers. There are also several other routes you can access from Bissoe, spanning 60km in all. And the trails aren’t just great for cycling – horse riders and walkers can also enjoy them too. It takes just over half an hour to get to the start of the Bissoe Trail from Bosinver. It’s easy to find – just off the A39 towards Falmouth from Truro (turn right at the Devoran roundabout, then look out for the brown signs). Parking is £3 for the day (or free with bike hire). There’s also a cafe at Bissoe which has a good range of family-friendly food on offer, plus traditional Cornish cream teas and delicious Callestick ice cream. If you haven’t brought your own bikes with you, Bike Chain Bissoe Bike Hire have a range of bikes available for children and adults, complete with all the necessary accessories. Hire costs start from £8 for a kid’s bike for the day, and this includes a helmet, pump, lock, tool kit, back pack and free parking. Advance booking is recommended, particularly if you fancy trying out one of their tandems. Bike hire is available all year round. You can contact Bike Chain Bissoe Bike Hire on 01872 870341, or look them up online. If, like Wilf, your children are coming to the age where it’s time to learn to ride a bike on their own, you might find this guide from the Bike Hub helpful for getting started. 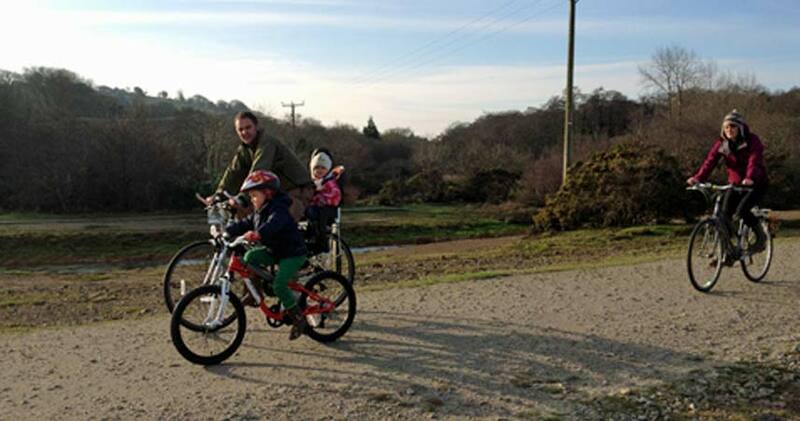 Where are your favourite places to cycle with kids in Cornwall? We’d love to hear any suggestions and stories about your cycling adventures!